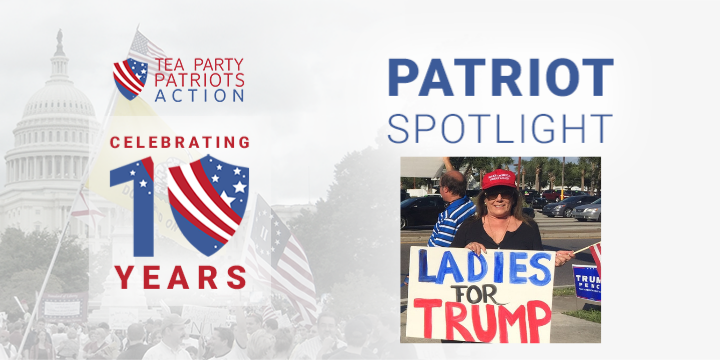 To celebrate our ten-year anniversary of the tea party, we are doing a weekly spotlight of our members and activists. Barb Haselden credits Rush Limbaugh with teaching her the solid lesson of perseverance and the value of hard work which led to the success of her insurance agency. She is a widow and a grandmother of three who started her own business in 1989. She was in disbelief when Obama was elected president and his dangerous ideas were becoming a reality. Obama’s radical ideas meant all her hard work and her progress toward achieving the American Dream would be shattered. Almost immediately after the country began heading into a socialist transformation period, Barb began looking for opportunities to fight back. Barb found the Tea Party by chance. She was listening to the Glenn Beck Show when he highlighted Tea Party meetings all over the country, including one near her. Nearly 200 people of Pinellas County, FL showed up – all of whom were mostly unknown to one another but like-minded and eager to organize. Barb and like-minded patriots began planning; she even offered up her business office for committee meetings. Within a couple of months, Barb was the leader of the South Pinellas 912 Patriots chapter. Today, her chapter has 1,047 members in Pinellas County, Florida. The last 10 years have been the most meaningful of Barb’s life. She is surrounded by friends who join with her to fight – locally and without hesitation – one battle after another. Barb continues the fight because we are in the middle of this war, not at the end. Nationwide, the Tea Party’s actions stopped the momentum of the Democrats when we took back the House and President Trump was elected in 2016. We did it once and we can do it again! With patriots like Barb, we must hold this ground and do everything we can do to help President Trump trample the threat of socialism. Patriots, join us on April 15 nationwide to Stop Socialism and Choose Freedom!